Norwegian explorer Roald Amundsen, best known for his pioneering visit to the South Pole and sail through the Northwest Passage, disappeared in 1928 when his plane went down during a mission to rescue Italian explorer Umberto Nobile. Only a wing float and a fuel tank from his aircraft, the French twin-engine flying boat Latham 47, were recovered. Today, more than 80 years later, the search for the aircraft begins again as New Zealander explorer Rob McCallum and his team set out to find the lost plane. Their tragic ordeal was immortalized in Apsley Cherry-Garrard’s The Worst Journey in the World (ranked our #1 favorite adventure book of all time): In 1911 three Brits slogged 130 miles across Antarctica’s Ross Island in the pitch-black, blow-high-hell dead of the polar winter. And all for the unlikely prize of three emperor penguin eggs. And now the story—this time from expedition leader Edward A. Wilson’s original 40-page handwritten journal with illustrations—can be yours for a mere £100,000. Bonhams in London will auction the forgotten treasure in mid-September. We now have 40 Wild Chronicles videos, hosted by National Geographic's own Boyd Matson, up on our site. In each episode, top explorers and field scientists traverse the globe, from Antarctica to Iceland, to report on the state of the natural world. One of our favorites is "Antarctic Orca Hunting"—not because we particularly enjoy watching these killer whales find their food source (read: kill), but because nature is just plain fascinating. The video begins with a brief overview of summertime in Antarctica, where the balmy 30-degree water is the food court for its inhabitants. But the main action happens around the 3:30 mark, when a group of seven orcas hunt together, a feat rarely captured on video. The whales circle around a lone seal stretched out on a small ice floe—begging the term "sitting duck" to be renamed—and employ amazing techniques to not only kill the seal, but teach the youngin' orcas how to hunt. Fascinating stuff. Even as more of the Wilkins Ice Shelf in Antarctica threatens to crumble, in part due to warming temperatures, man’s influence on the continent is being heavily debated during these next two weeks in Baltimore. Timed to honor the 50th anniversary of the signing of the treaty that governs the continent, more than 400 officials and observers from around the world have gathered to ponder its future. A seemingly bold, initial proposal was delivered by the Obama Administration at the onset of the meeting, via the office of Secretary of State Hillary Clinton, which wants to amend the treaty and impose mandatory limits on the size of cruise ships sailing there and the number of passengers they bring ashore. Amending the Antarctic treaty is difficult, in part because it requires the unanimous agreement of all 47 signatory countries. The new U.S. proposal contains no specific enforcement mechanism or penalties for limiting tourist operations. But it would require signatories to the pact to ensure that Antarctic tour operators bar ships with more than 500 passengers from landing sites, restrict landings to one vessel at a time per site and limit passengers on shore to 100 at a time. These numbers match the current voluntary limits, but go a step further by asking they become the official language of the treaty. The number of tourists visiting the continent continues to boom; more ships and more people means more potential for calamity - in the past two seasons I’ve watched one ship sink, two more run aground. And there are other, unreported accidents each season. In 1992-93, 6,700 tourists visited … this past year more than 45,000. It’s clear that something needs to be done to limit or at least legally monitor the boom. I’m surprised such a specific proposal came from the U.S. … But I like it. Read Jon Bowermaster's recent feature on Antarctica, "The White Continent Heats Up," see a stunning photo gallery by Peter McBride, and post your comments below. The collapse of an ice bridge in Antarctica linking the Wilkins Ice Shelf to one of two islands provides further evidence of rapid climate change (read the BBC article). The shelf, which is the size of Jamaica, and culturally, much less interesting, was completely stable until the late 1990’s and is now in danger of breaking away from land completely. The Russian space agency Roscosmos is expected to name the developer of its next-generation space craft today. According to the BBC, the new shuttle, which will not take flight until at least the end of the next decade, will come in two models: a 12 ton earth orbiter and a 16.5 ton moon orbiter. Cyclists no longer have to choose between pragmatic and environmentally friendly apparel, thanks to the San Diego-based company Zoic. The company’s new Enlightened Line will include a small offering of shorts and tops made from an organic and bamboo charcoal blend. Although some of these “green” products contain polyester, your conscience should still be considerably lighter. And as we all know, when it’s just you and your bike, every ounce counts. Learn more in the article at treehugger.com. Despite the new administration’s recent environmental policy push, the lethargic economy is still preventing some from fully jumping on board. The state of Florida, for one, is tightening its eco-belt. The state had originally planned to purchase 180,000 acres of the Everglades from the United States Sugar Corporation in an attempt to restore the endangered wetlands. Now, instead of dropping more than $1 billion on the deal, Governor Crist pledges to buy 72,500 acres for $530 million. Let’s hope for the state's sake he doesn’t get cold feet again: besides serving as a rich wildlife habitat, the wetlands act as a natural purification system and inhibit flooding. Read the New York Times article. Please be sure to visit the memorial site of skiing legend Shane McConkey, who died in a ski-BASE jumping accident last Thursday (3/26) in the Dolomites. Through his fearless back-country skiing and ground breaking technical innovations (he invented the reverse side cut and reverse camber skis, aka: what everyone currently uses to ride powder), he changed the face of his sport and will be sorely missed. On Januray 7, a trio of Canadians claimed to have completed their trek across Antarctica to the South Pole in a record breaking 33 days 23 hours and 30 minutes, according to explorersweb.com. Their new record would outstrip the one set earlier this season by American Todd Carmichael (39 days 7 hours and 49 minutes). The team, consisting of ultramarathon runner Ray Zahab, adventurer Kevin Vallely, and Arctic guide Richard Weber, endured white outs, altitude sickness, vertigo and large blisters on their 700 mile trek while lugging 170-pound kevlar sleds full of equipment reports the BBC How did they keep their tanks fueled for the long, cold haul? They ate 7,000 calorie-a-day diets of deep fried bacon, cheese, and chunks of butter. The expedition was the second leg of Zahab and Vallely's Impossible 2 Possible expedition which aims to raise awareness about global environmental issues. It kicked off last May with an utlramarathon in all 13 Canadian provinces in 13 days. Go the expedition website to check upcoming expeditions in Liberia and the North Pole. When we hear the word “panic,” most of us imagine someone running around and screaming. But panic takes many forms. It can be thought of simply as any behavior that occurs when the level of stress or emotion is high enough to prevent conscious thought and deliberate decision-making. For example, most people panic when they fall or when they’re knocked down. The panic may be brief and not very intense, such as when you slip on ice and scramble to get back up. But it can also be incredibly powerful. In the summer of 2000, a 35-year-old climber in Alberta grabbed a loose hold while soloing the southwest face of Mount Colin and fell more than 200 feet, hitting solid rock at the bottom. He died from extensive trauma, but even in his panicked state he was still trying to get back up. In emergencies, such a powerful natural response can seem nearly impossible to suppress. On June 26, 1996, a 44-year-old man fell from a raft into the upper Hudson River near North Creek, New York. Despite being warned against doing so, he quickly tried to stand up. His foot was immediately caught between two rocks. Although the water was fairly shallow, the current pushed his upper body down and held him under. It stripped off his life vest, and he drowned. Foot entrapment is a common cause of death on rivers, because when boaters fall into the water, their momentary panic overrides the ability to think logically, and they forget what they’ve been told: Don’t stand up. It may seem like panic is all about the mind, but panic is really about the body—or, more precisely, how you’re reacting to what the body is experiencing. 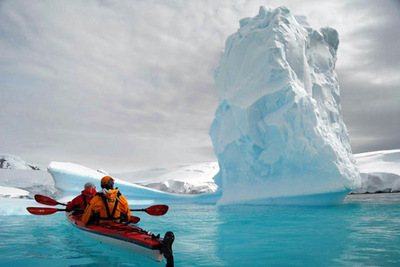 National Geographic ADVENTURE contributing editor Jon Bowermaster has returned to Antarctica this season, after last year’s five-week-long expedition by sea kayak and sailboat ("The White Continent Heats Up," November 2008). Wtihin days of his arrival, a tourist boat ran aground along the Antarctic Peninsula, the M/V Ushuaia, showing the world just how treacherous the waters and ice of the Southern Ocean can be. Though the Ushuaia’s 122 passengers were safely off-loaded and flown back to Argentina, it’s a reminder that as more and more tourists come each season, there will continue to be more accidents. (Last season, traveling aboard the National Geographic Endeavour, Bowermaster was among the first on the scene at the sinking of the veteran Antarctic tourist ship The Explorer – see NGA Special Report, March 2008). Bowermaster also reports on continuing trends of warmer temperatures, disappearing Adelie penguins and more rain, evidence of global climate changes impacts on the seventh continent. Follow his dispatches at www.jonbowermaster.com. Just back from paddling at the bottom of the world, we asked the intrepid Jon Bowermaster to tell us about his trip. Stay tuned for the upcoming feature story. The Adventure: Five weeks sea kayaking the Antarctic Peninsula, the final of expedition of his OCEANS 8 project, a decade-long endeavor to explore the world’s oceans and coastlines. In January, the team went to Antarctica for an up-close look at how climate change is impacting this very rugged, fragile part of the world. Most Exciting Moment: "We were at about 66 degrees south, past the Antarctic Circle, when we spotted a sizable iceberg with a beautiful sculpted arch when we decided to get closer for a look. By incredible coincidence, as we sat in our boats, the iceberg the arch began to collapse, ice block by ice block, dropping with a huge bang into the sea. As we watched the entire arch collapsed in front of our eyes, which none of us–-with more than 100 collected years in Antarctica-–had ever seen before." Most Underappreciated Piece of Gear: "Thermos. Nothing like a hot drink in the middle of a cold paddle to revive fingers, toes, energy, and psyche." 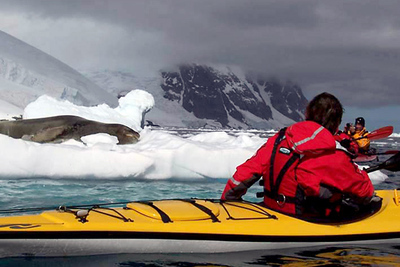 Strangest Animal Encounter: "We paddled through the beautiful Lemaire Channel, known as “Kodak Channel” by many for its incredible picturesque qualities, and passed an ice floe bearing an 800-pound leopard seal. Initially we were cautious about paddling too close, knowing that it could split our kayaks in two with a single bite, but eventually we did get close enough to hear him snoring. At one point he lifted his head and stared us down, but with the knowledge that he was definitely at the top of the food chain … he went straight back to sleep." Favorite Expedition Meal: "The advantage of traveling in sea kayaks is that you can take lots of stuff. A memorable tent-side meal was spring vegetable soup, with rice and parmesan cheese accompanied by chorizo and pate. More typical, of course, was a handful of nuts and hunk of jerky." Best Way to Keep Warm: "Don’t change clothes. Despite the temptation after a long, cold paddle, it’s best to stay in your paddling gear while your tent is set up, camp is made, etc. That way you are left with one wet set of clothing and another that remains perfectly dry until you get into your tent and change. Though I don’t use them, several of my teammates are firm believers in hand and toe warmers, the kind you put inside gloves and shoes. Just make sure the expiration dates are still valid!"